This healthy Gingerbread Granola Recipe is wonderfully flavored with molasses and spices, perfect for the holidays. Package this granola in a jar with a ribbon for a delicious edible homemade Christmas gift. 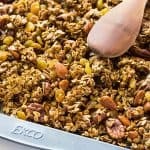 Considering my insane love for granola, I was surprised to realize it has been almost 2 years since I last posted a clean granola recipe. For a while there, overnight oats and (newly discovered) baked oatmeal were dominating my oats for breakfast habit. But I am back on the granola bandwagon, at least for a while. And I make sure to make a new batch of granola weekly to have on top of my yogurt. For the last few weeks leading up to the holidays, this gingerbread flavored Christmas granola has been my go-to. 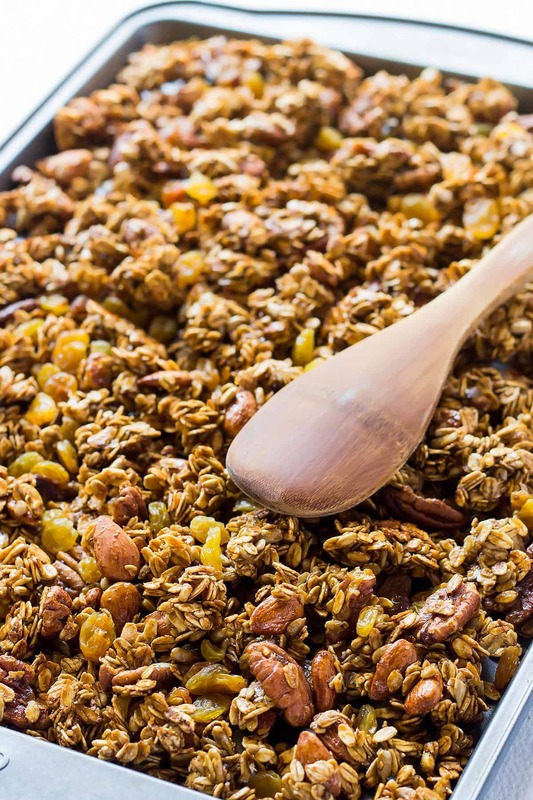 How to make Gingerbread Granola? Every year around the holidays I mix up a batch of my favorite gingerbread spice mix, get a jar of molasses and give a few of my favorite recipes a gingerbread spin. This year it was gingerbread muffins and finally gingerbread granola. So, as you may already guess, my key to gingerbread flavor is the combination of molasses and my spice mix, which includes cinnamon, ginger, cloves and also cardamom, star anise and a touch of black pepper. I always associate honey with gingerbread, since traditional German gingerbread is also called ‘Honigkuchen‘ – honey cake. So I chose honey as sweetener for this holiday granola recipe. 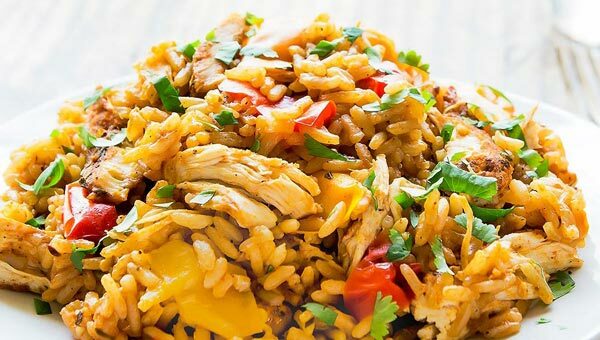 However, to make this recipe vegan version, the honey can easily be replaced with maple syrup or agave. I also added almonds, pecans, sunflower seeds and golden raisins. If you like a ginger kick, you could also add chopped crystallized ginger to the mix. It depends. 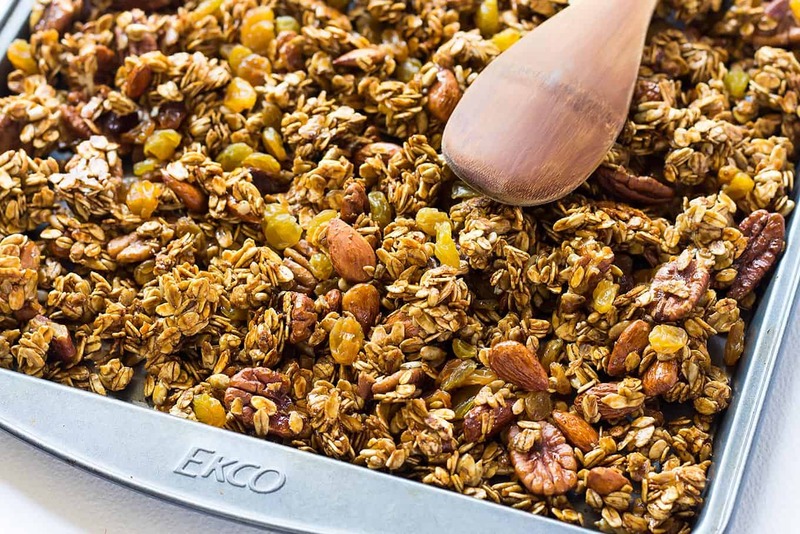 Whether granola is good for you depends on what is in it and who made it. 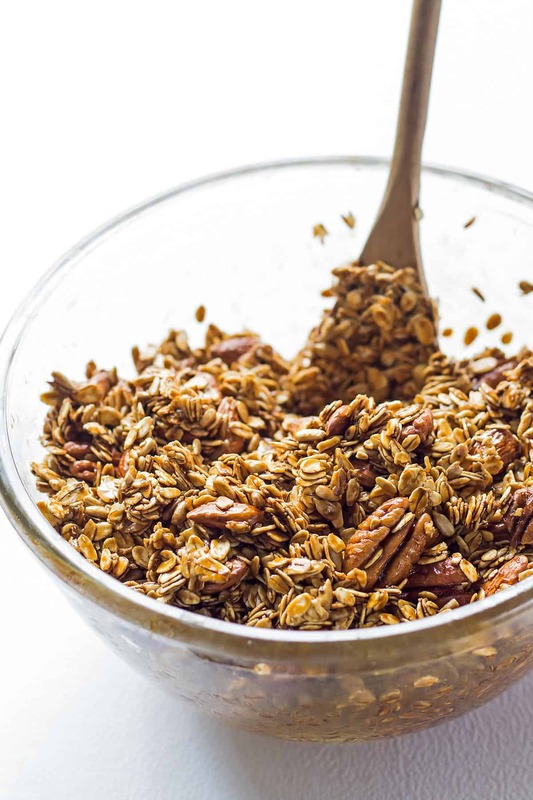 Homemade granola can definitely be healthy, but unfortunately many store-bought granola brands include trans fats and a lot of refined sugar. 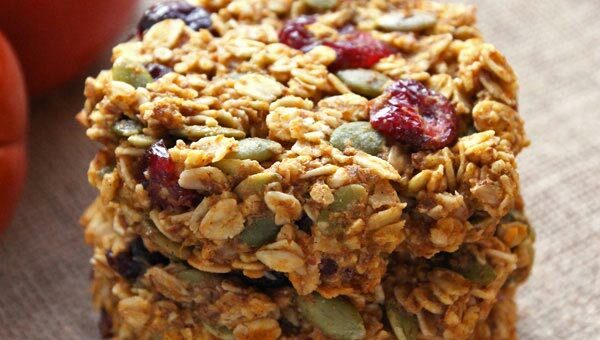 All of my homemade gluten free granola recipes can be considered healthy and most are even clean eating granola recipes. Coconut oil is my healthy fat of choice and I use honey and maple syrup as unrefined sweeteners. 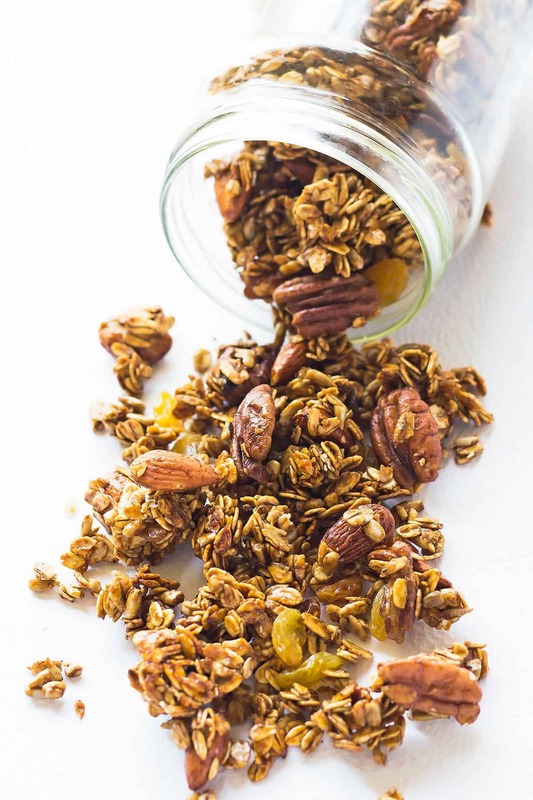 With today’s honey and molasses granola you are also getting the benefits of vitamins, minerals and amino acids. Especially blackstrap molasses is a great source of iron and potassium. I am so glad you are asking. For the most part, I consume granola for breakfast on top of a bowl of yogurt with sliced fruit – like a deconstructed (or lazy men’s) granola yogurt parfait. Only on rare occasions will I eat my healthy granola like cereal, just with some cold milk. When a recipe for granola comes out with nice big clusters – like this gingerbread holiday granola, it also becomes one of my go-to snacks. 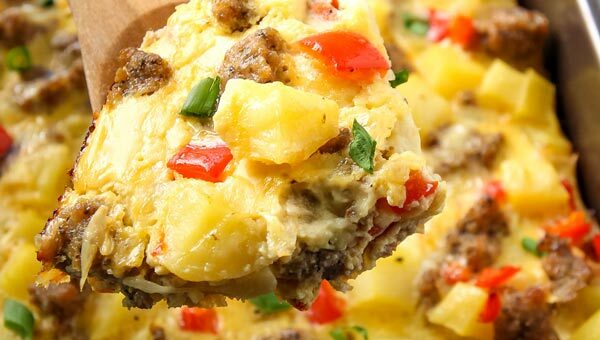 Perfect for munching on while out and about or even during a movie. Finally, a granola jar also is a wonderful gift idea for the holidays. Especially granola flavors like today’s gingerbread version. Pick a large Mason jar, tie it with a pretty ribbon and add a label. And ready is an easy homemade gift that will be much appreciated! In a large bowl, stir together oats, nuts and seeds. Add gingerbread spice mix and salt. Stir in the wet ingredients (honey, melted coconut oil, and molasses) until fully combined. Spread the gingerbread granola mix onto a large cookie sheet and bake for 15-20 minutes until obviously browned but not too dark. Stir once half way in. Remove baking sheet from oven and sprinkle the hot granola with the golden raisins (and optional crystallized ginger). Let the granola cool on the baking sheet. 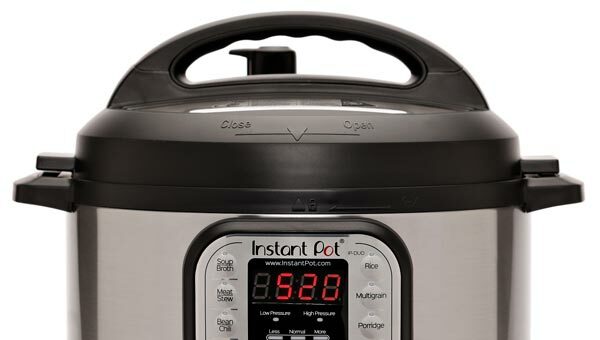 Break it into smaller chunks as you are filling it into an airtight storage container. I like to store my granola in large Mason jars.